There are two packages available for this event; the Bavarian, or the VIP package which includes three 14 ounce beers in a souvenir mug along with a 5 ounce sampling mug with 10 tastes. This package is limited to 250 sales. The Prost package includes a 5 ounce sampling mug with 10 tastes and two 10 or 12 ounce beers. Refills will be available for $5.00 at the venue’s discretion. 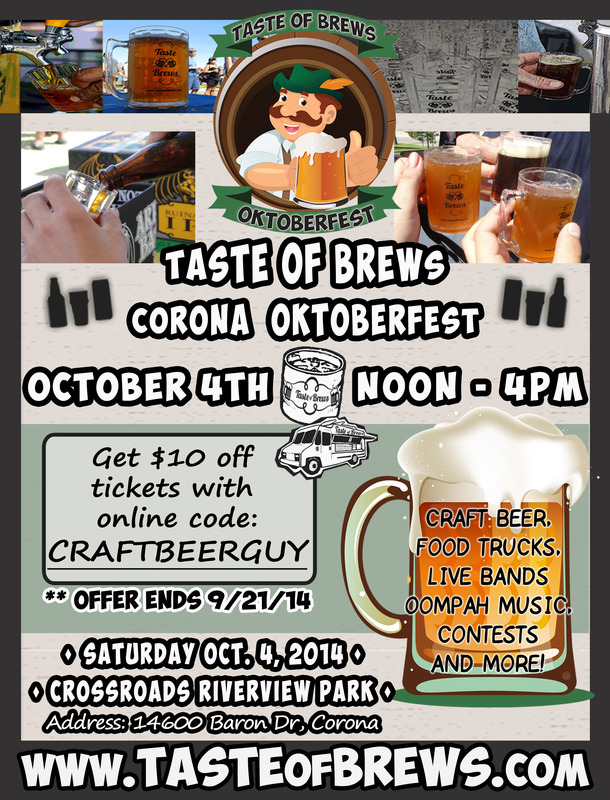 The Bavarian package is $45/each and the Prost is $35/each; however, if you order early and use the PROMO CODE: CRAFTBEERGUY you will save $10 on each ticket purchased by September 21; after that, the promo code will save you $5.00 per ticket. A portion of the funds raised from this event will go to benefit L.O.R.E. and the 1st Marine Division at Camp Pendleton. Crossroads Riverview Park is located at 14600 Baron Drive, at the intersection of River Road & Baron Drive, near Archibald, in Corona. Parking will be $5.00 and cash is appreciated. 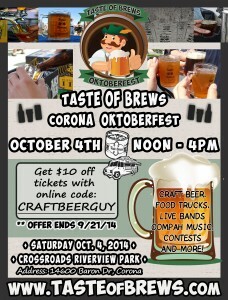 For more information please visit https://toboktoberfest.eventbrite.com/?discount=craftbeerguy. I hope to see you there; cheers!